After spending the entire day at work yesterday, today was a day to address the Inner Geek (IG). Some people have an ID and an Ego, I’ve got an IG. Ideally, of course, I would have had a full two day weekend, gone hiking and to the BBQ yesterday and geeked out today, but you do what you can, right? So today, I headed downtown to the California Science Center to see the Star Wars exhibit. The Exhibit was smaller than I expected, but it was an interesting cross between film props, interviews with some of the crew on the films, and extrapolated science technology. For example: the prop of Luke’s LandSpeeder next to an activity station for kids to build mini maglev trains out of legos and run them on a track. It was one of those days I really, really wished that I was 8 again, because the little GeekHiker’s head might just have exploded with excitement. 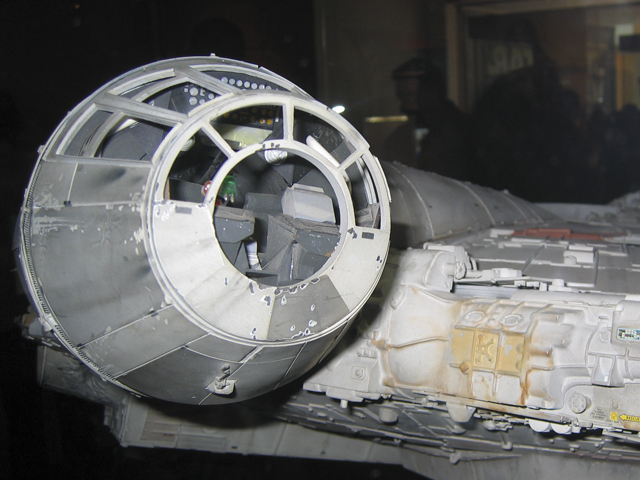 This is the cockpit from the Millennium Falcon, the original 4-foot wide, 75 lb. 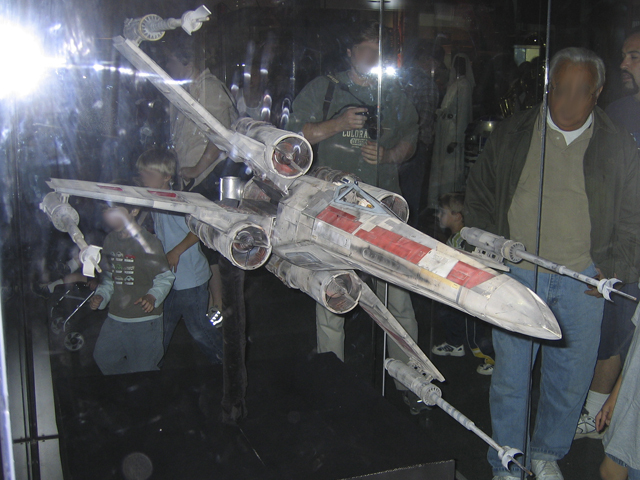 miniature built for the first film. Again, look at the beautiful detail. Luckily, George Lucas has kept all of these in his collection. For me, it was a sad day when Paramount auctioned off the miniatures from it’s Star Trek productions. Sad because these miniatures, which really are one-of-a-kind works of art, have in many cases gone to private holders and may never be seen again. Although if George wanted to sell Jar Jar Binks on E-Bay, we’d all be just fine with that. Not that he’d get any bids. When I was in my teens, I dreamed of growing up and going into the effects industry, being on stage, lighting and shooting models such as these. Unfortunately, I was born about 20 years too late: by the time I was in college and working my way towards the idea of an effects career, the industry was already moving away from models and to and all digital environment. And the last thing I wanted to do was sit in front of a computer all day. So now I have a job where I sit in front of a computer all day. Life’s funny that way. The exhibit is open until the end of the month. See it if you can. But go early in the morning, and beat the crowds. Stay for lunch, as did. It’s a bit pricy, but it’s decent food. And they have pie. I didn’t have any (trying to abstain from pie at the moment), but I was tempted. After the Science Center, I wandered over to the Natural History Museum of Los Angeles County. There’s no traveling exhibits right now, and I’d seen all the standing exhibits before. Even worse, they’re refitting the museum, and the Discovery Center was closed so I couldn’t see the prehensile tailed skink, a mellow little chap I like to hang with. But the butterfly exhibit had just opened. 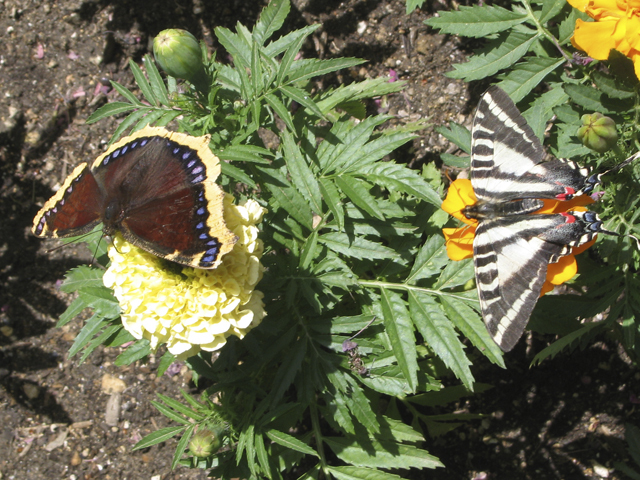 And there’s just something relaxing about sitting on a bench, watching these little guys flutter around. Not a bad one-day weekend. there is never a good reason to abstain from pie.